Perhaps the first scientist to have realized that permafrost and seafloor methane hydrate release may have played a role in the end-Permian extinction was Doug Erwin (1993), following the proposal by Paull (1991) tying regression to hydrate release by depressurization. Erwin indicated that methane and carbon dioxide (from both the oxidation of exposed continental shelf organic carbon and methane, "and possibly other sources") would have contributed to global warming and "possible oceanic anoxia" (1993, p. 256). Oceanic anoxia is an excellent mechanism for killing off aerobic marine organisms, but Erwin was clearly hesitant about invoking it for the end-Permian, hedging his tentativeness with the words "possible" and "perhaps" (1993, p. 256). It may be that Erwin realized that his model was severely limited by the great length of time over which he believed the extinction to have taken place. He thought that the extinction had taken place over a period of about three million years, "and perhaps as many as 8 million years" (1993, p. 226). Over such extended lengths of time, neither methane nor additional carbon dioxide would have had much effect -- if any -- on atmospheric concentrations of carbon dioxide or ocean chemistry. What Erwin missed was the importance -- indeed, the indispensibility -- of the rapid increase of these gases for the transformation of global climate and marine chemistry. (The rate of release is crucial. A truck, moving at 100 kilometers, or sixty miles, per hour, can be extremely dangerous to things in its path; at a meter -- yard -- per hour, the truck would constitute little or no danger. Just as the truck's potential threat depends on its momentum and therefore its speed, so also does the ecological impact of methane and carbon dioxide depend on their ecological momentum, or rate of increase. The faster the delivery, the harder the blow.) Methane released from hydrate slowly (over a period of many millions of years), for example, would have easily been consumed by just a small rise in the population of methanotrophs, which would have increased in response to the greater availability of their staple, methane. (Erwin later reduced the amount of time he thought the extinction had taken, stating that, "There is, however, little support for claims that the mass extinction occurred over eight million years, but it is unclear whether the extinction lasted two million years, 1 million years, or even less" [Erwin, 1994]. He also came to attribute the extinction to "synergistic" cause[s]. "Synergistic" is a ten dollar word [meaning "working together"] with, in this context, a nickel's worth of content, reflecting a Texas sharpshooter's lack of specificity. The causes of all mass extinctions are complex and interactive. However, Erwin further indicated that "The cause of the end-Permian mass extinction appears to involve a tangled web rather than a single mechanism." At just about the same time that Erwin was developing his regression scenario, an Australian researcher was coming to similar, but more focused conclusions about the end-Permian carbon isotope excursion and its likely consequences. Based on his examination of numerous ancient ocean basins on the margins of the Australian continent, Richard Morante discovered a massive shift of carbon isotopes ranging, in various basins, from -5 to -8. Like Erwin, Morante traced the carbon isotope excursion to a worldwide regression caused by the assembly of Pangaea and the slowing of the rate of the subduction of oceanic plates under that megacontinent (Morante, 1993). 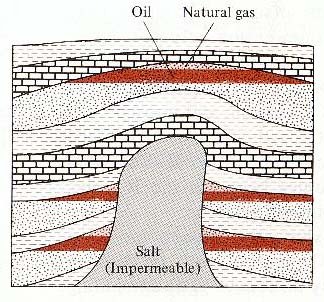 But Morante understood the isotopic excursion to have been the possible result of "the release of potentially huge volumes of 13C-depleted methane stored in clathrates in tundra environments and polar continental shelves," which, together with increased carbon dioxide released from continental shelf sediments, would have created a greenhouse world. In addition, Morante found that the negative carbon isotope excursion took between 300,000 and 600,000 years, making for a much shorter extinction event than that contemplated by Erwin. (As noted previously, we now know that major hydrate methane releases actually take place in less than 10,000 years.) Basing his estimate of the length of time needed for post-extinction recovery on the carbon isotope record, Morante placed the emergence of the planet from its end-Permian trauma at about the latest Middle Triassic, roughly ten million years later. Morante also recognized that the end of the Permian brought a reduction of global oceanic thermohaline circulation, though he did not specifically tie this to the hydrate methane release (Morante, 1993). The continental margin methane proposal presented here and previously (Vermeij and Dorritie, 1996; Dorritie, 2002) incorporates some of the undisputed facts about the end-Permian world. It accepts that Siberian Traps volcanism had a powerful effect on Permian world climate. But rather than the Traps eruptions being the sole cause of the extinctions, it sees the Traps as having had an important role, though largely as a trigger for the release of hydrate methane and the free methane below. Traps eruptions facilitated this release in two ways: first, directly, by heating terrestrial permafrost and northern continental margin sediments. This direct heating would have been by lava flows, pyroclastic eruptions (superheated, ground-hugging, volcanic dust clouds), and ash falls, and would have led to the immediate release of methane from the affected areas. Traps volcanism would also have directly heated the seawater of the PaleoArctic Ocean (the northernmost part of Panthalassa; sometimes referred to as the Boreal Ocean), and that warmed water would have heated seafloor sediments and released methane from the continental margins across which it flowed. In addition, by injecting vast quantities of carbon dioxide into the atmosphere and thereby warming the planet and the ocean, Traps volcanism would have indirectly heated continental margin hydrate and released much of its methane. Traps volcanism would have had important additional consequences unrelated to continental margin methane release, but providing in themselves mechanisms for altering the course of life on Earth. Volcanic gases would have been oxidized and hydrated, producing huge quantities of acid, the most important of which would have been carbonic and sulfuric acids. These would have adversely impacted both terrestrial and marine organisms. The outpouring of volcanic ash would have had additional major effects, largely in the ocean. There the ash would have provided fertilizer for phytoplankton. While underfertilization is bad -- it leads to starvation of the underfertilized organisms -- overfertilization and exceptional phytoplankton productivity may be bad as well. As phytoplankton populations explode due to overfertilization, other organisms are deprived of the oxygen used by the decomposers of dead phytoplankton. Volcanic ash, therefore, by providing fertilizer, would have facilitated oceanic dysoxia in the deeper ocean. Finally, of course, the great amounts of water vapor and carbon dioxide emitted by the volcanism would have warmed the planet. Any northern sea ice that had not been melted directly by the heat of the volcanism itself, by seawater warmed by that volcanism, or by the darkening of polar ice by volcanic ashfalls, would have melted as a result of the increased polar temperatures associated with global warming. The melting of sea ice would have produced fresher and warmer water at and near the pole, causing a significant disruption of global thermohaline circulation. But the major effect of Traps volcanism, in this scenario, would have been to rapidly release continental margin methane. The release of margin methane would have had several important effects, each of which would have had serious consequences for living things. First, methane itself is, like carbon dioxide, an asphyxiating gas, depriving aerobic organisms of needed oxygen. When released in the ocean, it would have impaired the metabolism of aerobic marine organisms, and, in sufficient concentrations, would have caused death. Although, upon reaching the atmosphere, methane could have had similar effects on non-marine organisms, its concentrations would have been unlikely to do much harm, because methane is lighter than air and would have been easily dispersed by winds. As methane gas from continental margins moved upwards through the overlying sediment, some would have been oxidized by the (anaerobic) methanotrophic organisms which lived in the top twenty meters or so below the sediment-water interface. The actual oxidation (uptake of electrons) of this methane would have been accomplished though the use of sulfate (SO¸4^2­), not oxygen itself, because all of the dissolved oxygen would have been consumed in the top few centimeters of sediment. The oxidation of the methane would have resulted in the removal of oxygen from the sulfate, and the production of sulfide (compounds with sulfur but no oxygen), most notably as hydrogen sulfide (H¸2S) gas and pyrite (iron sulfide, FeS¸2). Once the remaining methane escaped from the sediment into the ocean itself, more would have been consumed by aerobic organisms. One gaseous end product of these reactions would have been carbon dioxide. Thus the release and oxidation in the water column of continental margin methane would have both drawn down the oxygen and increased the carbon dioxide (causing death by carbon dioxide poisoning -- hypercapnia -- in susceptible organisms: Knoll, 1996). The carbon dioxide also would have combined with water to form bicarbonate ions (HCO^3­), which reacted chemically with dissolved calcium to produce calcium carbonate. This presumably was the main source of the "anomalous carbonates" observed by Grotzinger and Knoll (1995). Carbonates of similar origin, "in the form of chimneys and vent linings," can be found today along the top of Hydrate Ridge offshore from the Pacific Northwest, where methane escapes through faults from the seafloor. Photographs at the site reveal "muddy chunks...of alternating layers of pure-white methane hydrate, sediments, and limestone. But despite the limestone casing and the activities of the vent organisms, surprising quantities of methane escape into the surrounding ocean water" (Suess, 1999). Likewise, at the end of the Permian, large quantities of methane would have escaped oxidation and bubbled upwards through the seawater. When this methane reached the atmosphere, oxidation would have continued, slightly lowering levels of oxygen but significantly raising levels of carbon dioxide. Obviously, the amount of oxygen drawn down, and the amount of carbon dioxide produced, depended on the quantity of methane released. In the oceans, the drawdown of oxygen would have led to dysoxia, or, if the size of the methane release was great enough, to local or widespread anoxia. This would have had harmful effects on aerobic organisms, which require oxygen for survival. The effects would have ranged from mild physiological consequences to death, depending on the extent of the dysoxia or anoxia. Where anoxia became pervasive and enduring, as in the deep ocean, it would have been a major cause of the end-Permian marine extinction. With anoxic conditions in the deeper ocean, anaerobic organisms, including methanogens and sulfate-reducers, would have thrived. Their presence in an anoxic ocean would have given rise to two gases. One, obviously, was methane, and the methanogen bloom (population explosion) which would have taken place would have provided a continuous supply of methane both to the ocean itself (where much would have been consumed by methanotrophs) and to the atmosphere. The increased and sustained production of methane would have protracted marine anoxia and sustained high methane levels in the atmosphere. Meanwhile the sulfate-reducers would have pumped out a second gas, which for them is a waste gas: hydrogen sulfide (H¸2S), toxic both to marine organisms and those along affected coasts. The toxicity of hydrogen sulfide, in fact, is comparable to that of hydrogen cyanide (HCN), which is used in gas chambers. This toxicity is due to hydrogen sulfide's ability to combine with the iron found in numerous organic molecules, such as hemoglobin. Even the sulfate-reducers themselves are vulnerable to hydrogen sulfide poisoning, though the hydrogen sulfide gas typically combines rapidly with iron ions found in seawater, producing an insoluble black (iron sulfide) residue which colors the nearby sediments (Brock and Madigan, 1988, p. 578). In addition, hydrogen sulfide reacts with water to produce sulfuric acid, which would have pushed the oceanic acidity-alkalinity balance toward lower pH (more acidic) values, inflicting harm on acid sensitive organisms. The quantities of hydrogen sulfide that would have been produced in an anoxic ocean are not negligible: for each sulfate ion that is employed in the sulfate-reduction process, a molecule of hydrogen sulfide is produced (see Box). Sulfate reduction produces hydrogen sulfide (and several other ionic compounds, including the bicarbonate ion, HCO^3­) according the following generalized equation. The equation employs a sort of "averaged" organic compound as a starting point. This compound employs the "Redfield ratio" of carbon to nitrogen to phosphorus -- 106 C: 16 N: 1 P -- that is typical of many organic compounds. Some of the H¸2S is oxidized during upwelling, but some eventually is combined with dissolved iron ions to form pyrite (FeS¸2), which is insoluble and precipitates out. In addition, the excess alkalinity (represented in the equation by the bicarbonate ion, HCO^3­) combines with dissolved calcium ions to form calcium carbonate, which also precipitates out. This may be the source of some of the Permian-Triassic boundary "anomalous carbonates" noted by Grotzinger and Knoll (1995), and invoked by Knoll and co-workers (1996) in their oceanic overturn scenario. Even today the toxicity of hydrogen sulfide is environmentally evident. It is responsible for the death of many nearshore fish and invertebrates along more than 200 kilometers (120 miles) of the Namibian coast of southwest Africa (Weeks, 2002; Weeks, 2004). In December of 2003, more than two hundred Chinese perished and some ten thousand needed medical assistance from a release of hydrogen sulfide triggered by an explosion at a natural gas field. An area some 25 square kilometers (10 square miles) in extent was affected. The Chinese deaths point up one important characteristic of hydrogen sulfide: it is heavier than air (though not very much so). This allows it to hug the ground and kill organisms which live on or below the surface. Flying organisms such as birds and larger insects are therefore less vulnerable to hydrogen sulfide releases. (Along the Namibian Coast, rock lobsters flee from the sea bed to the shore during hydrogen sulfide emission events, while seabirds scavenge the floating corpses of gas victims; Weeks, 2000; Weeks, 2004.) Of course, the gas does dissipate fairly rapidly, especially with sufficiently strong air movement, but it may do so after having left much death in its wake. Special conditions give rise to the hydrogen sulfide emissions along the Namibian Coast. Cold, highly oxygenated water from the periphery of Antarctica moves north and wells up along this coast. Known as the Benguela Current, the water carries nutrients up from the deep ocean. This results in very high marine productivity, and consequently (though perhaps counterintuitively) in the drawing down of oxygen in the water column at fairly shallow depths as aerobic organisms decompose the descending organic debris. Continental shelf dysoxia and even anoxia ensue. In the diatomaceous ooze (the accumulation of uncountable numbers of diatom skeletons) which constitutes the ocean floor, the sulfate-reducers employ sulfate from ocean water to consume additional organic debris, discarding hydrogen sulfide as a waste product (Weeks, 2002; Weeks, 2004). If marine productivity were not so high, oxygen would not be so depleted, and much of the hydrogen sulfide would be oxidized in the water column. But along the Namibian Coast, there is not sufficient oxygen to do so despite the highly oxygenated current that sweeps by, and much hydrogen sulfide escapes into the atmosphere, bringing the harsh and toxic smell of rotten eggs -- and sulfuric acid aerosols -- to coastal villages (Weeks, 2002). Interestingly, some of the hydrogen sulfide is itself oxidized in the water column and thereby helps draw down any remaining dissolved oxygen. Furthermore, hydrogen sulfide is the one gas of those discussed herein (including carbon dioxide and methane) whose dramatic toxic impact on living things can be easily observed, although this impact occurs in a remote part of the world. One quite curious organism found 100 meters (yards) below sea level in the seafloor muds of the Namibian coast looks like a short string of tiny white pearls, each slightly larger than the period at the end of this sentence. When these "pearls" were first observed in shallow sediment samples, and then identified as bacteria, they produced a reaction of incredulity among many scientists because they were vastly larger than any bacterium previously known. They were, in fact, about 100 times larger across than the average bacterium, and about three million times its volume. The identification proved accurate, however: the organisms actually enclosed huge nutrient storage spaces (vacuoles). Inside the vacuoles were, among other things, tiny globules of elemental sulfur (hence the whitish color), obtained from the surrounding sulfidic waters. Much of the "pearl" therefore was sulfur; only about 2% was the enclosing organism (Schulz, 1999). This bacterium, named Thiomargarita namibiensis ("sulfur pearl of Namibia"), accumulates in anoxic conditions large quantities of sulfur which it oxidizes for energy by the use of nitrate. The sulfur apparently is stored to get the organism through long periods when sulfur is in short supply. Similarly, T. namibiensis also stores nitrate, which is only available during periods when major storms bring oxic waters, which carry nitrate, down to the seafloor (Schulz, 1999). Further investigation of this unusual organism revealed that it possessed an "auxiliary mechanism" for getting through hard times. In addition to storing sulfur and nitrate, it also stores polyphosphates, complex molecules containing phosphate (PO¸4^­3). During times when storms carry nitrate to the depths, carbon is oxidized and phosphate is taken up and stored as polyphosphate. When quieter -- and anoxic -- conditions return, T. namibiensis apparently breaks down the polyphosphate for energy, allowing it to take up and accumulate acetate (likely stored as glycogen, a major energy source for many organisms), while dumping phosphate in the process (Schulz and Schulz, 2005). These mechanisms help the organisms cope with the highly variable (and highly seasonal) upwelling conditions associated with the Benguela Current, and the turbulence created by intermittent major storms off the Namibian coast. Similar mechanisms are employed by organisms used in wastewater treatment plants to remove phosphates (Schulz and Schulz, 2005). The phosphate dumped by T. namibiensis and similar large sulfur bacteria (Thioploca and Beggiatoa, all members of the gamma proteobacteria phylum) seems to be the source of contemporary seafloor phosphate formation, often found upwelling areas. Presumably these organisms or their ecological equivalents (organisms which make their livings in a similar fashion) were responsible for the world's major phosphorite deposits (Schulz and Schulz, 2005), including the Phosphoria Formation of the US Mountain states (Idaho, Wyoming, Utah, Montana, and small parts of Colorado and Nevada). (The phosphate may have been blown from its place of origin to its current location, perhaps after the drying of the shallow sea in which it formed.) The Phosphoria Formation is of Late Permian age. Hydrogen sulfide may have played a major role in the end-Permian extinction. As oxygen levels in the Permian world ocean declined, the sulfate-reducing organisms would have gradually expanded outward from those limited anoxic habitats (in seafloor sediments and anoxic basins) to which they had been confined by the presence of oxygen elsewhere. As sulfate-reducers came to dominate the latest Permian and Early Triassic ocean, the hydrogen sulfide they produced would have contributed to the extinction of aerobic marine organisms. The record of such an expansion of sulfate-reducing organisms has, in fact, probably already been identified: it is the huge changes in sulfur isotopes that occurred at the end of the Permian, as noted by Kaiho (2001). Although Kaiho and his co-authors thought that the sulfur isotope excursions were due to an enormous impact, it seems more likely that the excursions they observed were the consequence of the greatly increased activities of sulfate-reducers. As with carbon, living things prefer to use the lighter isotope of sulfur. In preferentially using the oceanic sulfate with the lighter rather than the heavier isotope (that is, ^32S rather than ^34S), the lighter isotope would have become more prominent in the sulfide waste product of the sulfur-reducers and the heavier isotope more prominent in the remaining sulfate. In addition, however, the hydrogen sulfide may have breached its marine confinement and escaped into the atmosphere (Kump, 2005). Numerous detrimental consequences would have followed, quite apart from the direct poisoning of terrestrial organisms. In low concentrations, hydrogen sulfide has the interesting ability to cause mice to enter a hibernation-like or suspended animation-like state (Blackstone, 2005). In such a condition, they would become easy victims for predators, assuming that the predators themselves did not drop into the same lethargic state as their prey. (The effect of low concentrations of hydrogen sulfide has only been tested on mice, but similarly low concentrations may have similar effects on other mammals, or other animals.) But there were no mice around in the latest Permian/Early Triassic: rodents evolved almost two hundred million years later. Nonetheless, the mammal-like reptiles (therapsids) that did exist may have been likewise affected, and perhaps other organisms as well. More important than its sleep-inducing qualities would have been two other effects of atmospheric hydrogen sulfide. Hydrogen sulfide readily combines with the hydroxyl (OH^­) ions in the atmosphere. Hydroxyl is the major methane-limiting component of the atmosphere; without it, methane concentrations can increase almost without limit. More importantly, the depletion of hydroxyl increases the longevity of methane in the atmosphere, so that instead of having a residence time (lifetime) in the atmosphere of less than ten years, methane can stick around much longer, significantly extending its powerful greenhouse gas warming. If hydrogen sulfide did escape confinement at the end of the Permian, global temperatures would have skyrocketed (Kump, 2005). Furthermore, atmospheric hydrogen sulfide also combines with and thereby consumes ozone (O¸3). Today there are two places in the atmosphere where important quantities of ozone may be found. One is near ground level, where automobiles and trucks produce often hazardous concentrations of ozone-laden smog. There were no internal combustion engines 250 million years ago, so there were no important concentrations of ozone at ground level at that time. But ever since the earliest phytoplankton started pumping significant quantities of oxygen into the atmosphere, perhaps some 2.5 billion years ago, high altitude ozone (the "ozone layer") has been extremely important to life on Earth. This ozone absorbs and therefore blocks ultraviolet (UV) light from the sun, which is quite dangerous for living things. Ultraviolet light is high energy radiation; as such, it can tear apart organic molecules and cause mutations and death to organisms. In fact, it is generally presumed that the lack of ozone in Earth's early atmosphere inhibited the evolution of complex organisms and prevented the expansion of living things onto the land, where they would have been exposed to destructively high levels of ultraviolet light. Only with the rise of atmospheric ozone could organisms have left the protection of their aquatic environments (water also protects against ultraviolet light) and venture out onto the land. With sufficient hydrogen sulfide being pumped into the atmosphere at the end of the Permian and in the beginning of the Triassic, the protection of the ozone layer would have been removed, and terrestrial and shallow-water-living aquatic organisms would have suffered mutation and death (Kump, 2005). Although a hydrogen sulfide release would have had these several major environmental consequences, however, the release scenario does have a number of serious difficulties. First, the scenario as presented relies on atmsopheric release through regions of intense oceanic upwelling. Such regions, where strong undersea currents carry nutrients from the deep ocean to shallow depths, are comparatively uncommon. Upwelling regions constitute only about 0.1% of the surface area of today's ocean (Kump, 2005). (The Benguela Current, upwelling along the coast of Namibia, is an example.) Nonetheless, they are critical to the scenario because they produce the eutrophic (highly fertilized) conditions that result in near-surface anoxia. But the anoxia and euxinia of the Permian ocean presumably had its origin in its stratification (ultimately due to global warming). A stratified ocean would likely have had limited upwelling, perhaps not enough to have allowed significant amounts of hydrogen sulfide to reach the ocean surface and thereby the atmosphere. Alternatively, hydrogen sulfide releases could have been confined to specific coastal areas near intense upwelling regions, just as with today's Namibian coast. In addition, anoxic conditions can permit the depletion of an essential nutrient, nitrate (Falkowski, 2004; Kuypers, 2005). So even if the amount of Permian ocean upwelling was equivalent to that of today (as the Kump, 2005, proposal assumes), that upwelling may have lacked the needed nitrate to induce eutrophic surface water conditions, anoxia, and hydrogen sulfide release. Finally, there is the matter of the level of Late Permian oxygen. Hydrogen sulfide escape from ocean confinement depends in part on the amount of oxygen in surface waters, which largely depends on the amount of oxygen in the atmosphere as it exchanges gas with the ocean across their interface. (The amount of surface water oxygen which is directly contributed by its phytoplankton inhabitants is relatively small.) Oxygen in the surface waters limits both the expansion of sulfate-reducers, which are anaerobes, and hydrogen sulfide itself, which it oxidizes. If the atmospheric level of oxygen in the Late Permian were low, therefore, it would have been easier for hydrogen sulfide to breach containment in the ocean. But oxygen levels were quite high, probably as high as they have ever been (at 30 to 35%: Berner, 2001), well into the Permian. The question is how long those high oxygen levels persisted. At the end of the Permian, oxygen levels were possibly much lower, dropping perhaps as low as 16% (Berner, 2002; Huey and Ward, 2005), though a more recent study suggests a range of between 33/34% and 15%, with a most probable value being about 20% (Berner, 2007). But when did the transition take place, and how rapidly did it occur? Unfortunately, the number of reliable data points across the tens of millions of years of the Permian is limited, and does not present a clear picture. But there may be another way of addressing the issue. Atmospheric oxygen levels depend on several factors. Among them are the activities of terrestrial green plants, the activities of phytoplankton, and the rate at which carbon (which would combine with oxygen to form carbon dioxide) is removed from contact with oxygen by burial in ocean sediments (called carbon export). There is no evidence of any significant or unusual changes in terrestrial flora in the Permian prior to the end-Permian extinction. Nor is there any indication of changes in the rate of carbon burial until we encounter the brown and black shales of Permian-Triassic boundary rocks. Data on Permian phytoplankton is minimal. In sum, there is no significant evidence of biological or ecological changes in the Permian that would have affected the level of atmospheric oxygen, with the possible exception of an extinction event about five million years before the end of the Permian (the end-Guadalupian extinction: Stanley and Yang, 1994; Racki, 2003). Lacking any compelling evidence for changes in those factors which would have affected atmospheric oxygen levels, therefore, the most reasonable assumption is that atmospheric oxygen levels nearing the end of the Permian were pretty much the same as at its start, and that it was the Permian extinction event itself which was responsible for the plummeting of those levels. If this reasoning is correct, then hydrogen sulfide releases to the atmosphere would have been one of the many effects of the end-Permian catastrophe (although a quite deadly one), rather than a cause of the catastrophe per se. Despite these difficulties, the hydrogen sulfide release scenario prompts some further comments. First, once the end-Permian ocean had become largely anoxic (and in anoxic areas, devoid of aerobic organisms), it would have been quickly resettled by anaerobes such as the methanogens and sulfate-reducers (which produce hydrogen sulfide). Sulfate-reducers, not being quite as strict anaerobes as methanogens, would have expanded into areas where there were low concentrations of oxygen (highly dysoxic areas), from which methanogens would have been excluded. But even in fully anoxic areas, sulfate-reducers would have outcompeted methanogens for certain important nutrients (specifically for hydrogen molecules and acetate: Brock and Madigan, 1988), though some methanogens can use other, less plentiful nutrients. Consequently, the sulfate-reducers would have become the main inhabitants of the anoxic deep ocean, sharing it with more limited numbers of methanogens. No wonder sulfidic (euxinic) conditions developed in the Early Triassic ocean (see the discussion of the Black Sea, below, in the Early Triassic Aftermath section). Second, because hydrogen sulfide readily combines with iron, it would have effectively scavenged iron from much of the ocean, combining with it and sending it to the bottom as iron pyrite (FeS¸2). Iron is an essential nutrient, and one which already exists in only limited quantities in the ocean. (That is why "iron fertilization" is being examined as a strategy for dealing with the atmosphere's excess carbon dioxide. Provided to phytoplankton, it creates "blooms" which, because the phytoplankton use carbon dioxide, helps reduce its presence in the air.) With iron availability already limited, marine organisms would have faced conditions of iron starvation once hydrogen sulfide became plentiful. Third, it seems quite unlikely that no hydrogen sulfide would have escaped oceanic containment, because it escapes in places today despite our very well oxygenated ocean. Once in the atmosphere in significant quantities, hydrogen sulfide would have interacted with hydroxyl ions (OH^­), and helped block the destruction of methane by those ions (that is, it would have increased the methane residence time), allowing faster, greater atmospheric warming. As the atmosphere's warmth penetrated the ocean, stratification would have increased (or been maintained), and the sulfate-reducers would have thrived. Thus, there could have been a kind of methane-hydrogen sulfide partnership, with each gas enhancing the presence of the other, until other factors (such as the drawdown of atmospheric carbon dioxide via increased weathering of silicate rocks) brought the era of the relationship to a close. Such a partnership may have also existed at other times of ocean anoxia, as indicated by significant negative sulfur isotope excursions: in the Early Cretaceous (120 to 100 million years ago: Paytan, 2004), and during the Paleocene-Eocene Thermal Maximum (55 million years ago: Paytan, 1998; Faul, 2005). Oxygen O¸2 A waste product of oxygenic photosynthesis. Chemically active; it combines readily with other elements. Not present in Earth's early atmosphere because oxygenic photosynthesizers (specifically, phytoplankton) had not yet evolved. Today's atmospheric level (about 21%) is maintained by the continuing activity of phytoplankton and terrestrial green plants. Required by all aerobic organisms. Highest level, during the Permian, was 30-35%. This level fell rapidly at the end of the Permian and during the Early Triassic, to perhaps 12%. Water vapor H¸2O The primary greenhouse gas, but not one that humans have much to do with, because of the vast amount of water covering the surface of the Earth. This surface water is freely exchanged with the atmosphere (in geologists' terms, atmospheric water vapor and surface water are "in equilibrium"). The quantity of water vapor in the atmosphere is determined by temperature, and varies greatly from place to place. When temperature rises, surface water evaporation increases, raising the amount of water vapor in the local atmosphere; when temperature drops, water vapor condenses out, as rain or snow. Global warming allows the total quantity of atmospheric water vapor to increase. Carbon dioxide CO¸2 The main greenhouse gas largely under the control of human beings. It accounts for most (roughly two-thirds) of global warming. Though there is a natural level of atmospheric carbon dioxide (with some variability over time), human beings are increasing the presence of this gas in the atmosphere at an unprecedented and likely catastrophic rate. This anthropogenic (human-caused) carbon dioxide will decline with the inevitable depletion of fossil fuels, but global warming will nonetheless increase for some time thereafter. Once the dumping of carbon dioxide into the atmosphere ceases, the amount of carbon dioxide will decline over the centuries, but an appreciable quantity (perhaps 7%) will still be around in 100,000 years. Methane CH¸4 The primary constituent of "natural gas," this greenhouse gas is often associated with petroleum or coal, and can cause asphyxiation or explosions in coal mines. Found in huge quantities in icy lattices (hydrates) in seafloor sediments, it can be released by depressurization or warming. Has considerably greater global warming potential than carbon dioxide. Roughly one-third of current global warming is attributable to atmospheric methane (though little of the present methane comes from hydrate). Hydrogen sulfide H¸2S A highly toxic gas, known by its rotten egg smell. Produced by sulfate-reducing organisms in anoxic marine conditions, it readily combines with iron in the blood of aerobic organisms, and, in sufficient quantities, kills them. Hydroxyl OH^­ This ion (electrically charged molecule) readily combines with both methane and hydrogen sulfide (among other atmospheric gases). Its presence in the upper atmosphere prevents the accumulation of much methane. The ozone is the great protector of non-marine life. Earth's early atmosphere contained no free oxygen (O¸2), and therefore no ozone (O¸3). Back then, any free oxygen that was somehow spontaneously produced would have quickly combined with other chemicals and would have disappeared from the atmosphere. Only with the origin of life and the subsequent evolution of phytoplankton in the oceans was enough free oxygen continuously produced that it was able to accumulate in the atmosphere. Thus, today's level of atmospheric oxygen (21% of the air) is entirely due to the activity of phytoplankton and terrestrial green plants. Along with the rise of free oxygen in the atmosphere came ozone. Stratospheric ozone absorbs much solar ultraviolet light, deadly radiation which causes genetic mutation and death to exposed living things. But once there was sufficient ozone in the ancient stratosphere, living things which previously existed only in the world's oceans, where they were protected by water, could begin to move onto the surface of the land. Though some single-celled organisms managed to make the evolutionary transition to land more than a billion years ago, terrestrial green plants took many hundreds of millions of years longer, as the level of atmospheric oxygen -- and ozone -- increased. By the Permian, atmospheric oxygen levels were at an all time high, and the creatures of the land were relatively well (but not completely) protected from ultraviolet radiation. Then came the end-Permian volcanism, spewing out halogen gases (fluorine, chlorine, and bromine), helping deplete stratospheric ozone. Methane would have made its own contribution to ozone depletion. But significant destruction of the ozone layer would likely have come about as an indirect consequence of a major hydrogen sulfide release. Both methane and hydrogen sulfide destroy ozone, but because hydrogen sulfide is a much heavier gas, it tends to destroy the ozone closest to Earth's surface. Being much lighter, however, methane can rise into the stratosphere. On its way, however, methane reacts with other gases and can be depleted or destroyed. But hydrogen sulfide is also a chemically active gas, and it can combine with and neutralize those gases which would interfere with methane's rise into the stratosphere. Despite its being largely confined to the lowest level of the atmosphere, therefore, hydrogen sulfide can facilitate the destruction of stratospheric ozone by methane. In fact, this scenario has been proposed as a significant killing mechanism in the end-Permian extinction (Lamarque, 2007), and the discovery of spores apparently damaged by ultraviolet radiation seems to confirm it (Visscher, 2004). But back to methane itself. The quantities of methane that would have been released at the end of the Permian would have combined with and slightly drawn down atmospheric oxygen. More importantly, a large methane release would have inhibited the production of oxygen both from marine phytoplankton, via altered oceanic chemical and biological conditions, and from terrestrial plants, by the increase of acid rain. Reduced oxygen production would have gradually lowered the atmospheric oxygen level, causing the metabolic impairment of terrestrial aerobic organisms. Compounding the effects of low oxygen would have been the increase in carbon dioxide, producing further impairment or death by hypercapnia to sensitive organisms in the surface ocean (which exchanges gas with the atmosphere), and physiological damage or death to organisms along affected coastlines. Carbon dioxide is heavier than air, and therefore does not dissipate as readily as methane, which is lighter than air, does. Its great killing power was demonstrated by the deaths of villagers and cattle unfortunate enough to be in its path when it erupted out of the bottom waters of Lake Nyos in Cameroon, Africa in 1986. An estimated 1800 people and 6000 cattle were asphyxiated in the eruption. Lake Nyos fills a volcanic crater; the high concentrations of carbon dioxide in its bottom waters result from the continual seepage of that gas from the magma chamber below. High marine levels of carbon dioxide have a further consequence. They produce the relatively mild carbonic acid, which nonetheless has the ability to erode calcium carbonate in shells, and to inhibit the production of calcium carbonate in those organisms that employ it in the creation of their shells. But the most important consequence of a colossal methane release would have been the warming of the planet by the greenhouse gas methane and its successor, carbon dioxide. We tend to underestimate the impact of global warming on other organisms. This probably stems, at least in part, from our own adaptability to the variable temperature of changing seasons, though we are assisted in our adaptation by adding or removing clothing and the artificially warmer or cooler environments provided by fire; gas, electric or oil heating; and air conditioning. In the more affluent parts of the world, mortality from exceptional hot or cold spells tends to be minimal, and generally affects only socially marginalized people: the old, the homeless, the poor. Other organisms are not so fortunate as affluent human beings. Though some organisms can grow heavier coats for winter and shed them in spring, or employ other survival strategies during cold, heat, or drought (seed production, leaf loss, hibernation, estivation -- that is, reduced activity during hot spells -- and so on), many have little or no ability to survive unusual warmth or cold. Nonetheless, the impact of global warming has been popularly assumed to be something which will only gradually encroach upon other organisms, and cause extinction only in unusual circumstances. Instead, habitat destruction has generally been presumed to be the major human activity which will adversely affect our fellow species. We no longer have any excuse for such naiveté. A careful examination of a large number of species in numerous parts of the planet projects that a stunning portion of them will be "committed to extinction" in just 50 years, with only modest global warming (Thomas, 2004). "Committed to extinction" means that, in the language of poet Pedro Pietri (1968? ), "their names [are] listed in the telephone directory of destruction," that is, the book of death. It does not mean that 50 years from now all these "committed" species will be gone, but rather that they will no longer have a habitat in which they can survive. The demise of the last members of such species may hang on for some decades, but their ultimate doom is assured. The findings are the result of a comprehensive examination of more than a thousand terrestrial species -- plants, insects, mammals, birds, frogs and reptiles -- in regions representing about 20% of the Earth's surface. The regions studied are located in all continents except Asia, and represent a wide variety of environments: boreal (northern), temperate, and tropical forests, tundra, grasslands, savannah, deserts. The amount of warming that was projected in the study was shockingly small. Three projections were used: 0.8 to 1.7 °C (1.4 to 3.0°F) in the minimal warming case, 1.8 to 2.0°C (3.2 to 3.6°F) with mid-range climate change, over 2.0°C (3.6°F) at maximum (Thomas, 2004; Pounds and Puschendorf, 2004). But with only this rather minimal amount of warming, and even with an assumed ability to disperse to more favorable environments, 11, 19, and 33 percent of total species (in minimal, mid-range, and maximal cases, respectively) will disappear. Mortality among those species with little or no ability to disperse will be considerably higher (34, 45, and 58 % in the respective no dispersal cases). Moreover, the "minimal" case (0.8 to 1.7 °C/1.4 to 3.0°F) represents the minimum expected warming by 2050: as the study's authors point out, this means that this level of extinction is inevitable (Thomas, 2004). In 50 years, more than 10% of terrestrial species -- at minimum -- will be on a one-way path to extinction; in 100 years, almost all those species will be gone. "Contrary to previous projections," the authors note, "[climate warming] (which they attribute to human activity) is likely to be the greatest threat in many if not most regions." The study did not examine the "historically unprecedented" carbon dioxide levels with which organisms will have to contend, or interactions between climate change and other ecological threats, which the authors indicate are likely to be even more severe than climate change in isolation (Thomas, 2004). The message of this study is simple: climate change kills -- and kills extraordinary numbers of living things -- even when it is minor. Global warming would also have had a major impact on the chemistry and biota of the oceans. Once the ocean began to warm, it would have begun to stratify. The downwelling of frigid but highly oxygenated water in polar regions would have slowed, and perhaps stopped. In today's world, this water is responsible for keeping most of the ocean (except for its surface layer) oxygenated. Without the input of large quantities of oxygen, the deep ocean would have become anoxic, and once anoxic, anaerobic organisms like sulfate-reducers and methanogens would have replaced the former aerobic inhabitants. Permian global warming would have had several additional consequences. It would have increased the rate of evaporation, making the continents more dry even while making the atmosphere more humid. It also would have increased the amount of water that the atmosphere could hold, and, because water itself is the dominant greenhouse gas, that water would have contributed to still further global warming. Cloud cover would have increased, but the role of clouds in determining climate is a matter of continuing discussion and much serious investigation among scientists, because clouds on one hand increase Earth's albedo (thus reflecting more solar radiation back into space) and cool the planet, and, on the other, increase the amount of warmth trapped beneath them. It is still unknown whether, on balance, clouds contribute more to planetary warming or cooling, though the answer is sure to be different for different types of clouds. As we have already seen, some clouds -- polar stratospheric clouds -- may have helped warm the polar regions at the beginning of the Eocene. More water vapor in the atmosphere, however, would have meant more precipitation, and this precipitation would have come in the form of more severe storms. Some continental areas therefore may have been subject to a kind of double whammy: drying out more because of increased evaporation, and then periodically getting hit by powerful storms. This is a prescription for drought punctuated by flash floods and rapid erosion, and would have imposed difficult living conditions on the many of the creatures of the affected areas. Other areas simply received more precipitation, which ameliorated harsher climates and made arid climates less so (Retallack, 2003). In South Africa's Karroo Basin, the additional precipitation may have been responsible for changing river dynamics and altering meadering rivers (which sweep in great curves across their valleys) to braided rivers (which are comprised of many interwoven strands). Although numerous factors control the specific shapes of rivers, the amount of flow is an important one, and braided rivers tend to indicate higher flow rates than meandering ones. The major extinction of terrestrial plants, whose root systems tend to anchor soils, is also a likely factor in altering river shape (Ward, 2000). Though the study of the effects of warming on terrestrial species (the Thomas, 2004, study) examines only present-day global warming, its application to the end-Permian is obvious. While the initial triggering mechanism is different -- the anthropogenic production of carbon dioxide in the present versus direct oceanic warming and indirect CO^2-induced global warming caused by Traps volcanism at the end of the Permian -- the effects would have been the same. The atmosphere warmed, and the ocean and the terrestrial surface with it. Huge numbers of species were not able to survive the changed conditions, and they died. Continental margin methane may be released in several different ways. Undoubtedly some methane trickles out from dissociating hydrate and the free gas below it. It presumably exits the sediments via the escape routes of single chimneys, small cracks and faults. This escape is presumably relatively steady in some places, more intermittent in others. This trickling (both of dissolved methane and small bubbles thereof) is probably the main way oceanic methane is released today. Although almost all of the continental margin methane is consumed by methanotrophs living near (within about 5 cm, or 2 inches) the sediment surface, some does exit the seafloor though "cold seeps." Cold seeps are places where fresh, cold water flows from the sediment. The coldness, and the freshness, of the water, is due to the dissociation of methane hydrate. Hydrates, remember, are composed of water ice. A given volume of methane hydrate contains 80% water, and the water is fresh because freezing excludes salt. Therefore, when methane hydrate dissociates, not only methane is released. A substantial quantity of fresh water is released as well. This water can be detected by oceanic probes, and can be used to locate the cold seeps from which methane also exits. A certain amount of methane is also carried upwards by the warmer fluids produced where ocean floor is being subducted beneath continents. As ocean plates drop down at active continental margins, their sediments are heated by the warmth from the Earth's interior, and compressed by the force of the two plates -- oceanic and continental -- pushing against each other. This warmth and compression dewaters clay minerals and forces their freshwater fluids out and up through the overlying sediments. These fluids carry high concentrations of both methane and hydrogen sulfide. As with other methane that is released through the sediments by trickling, most is consumed by methanogens near the sediment surface. On the sediment surface, the fluids produce mud mounds, just as do the methane-bearing fluids from and below the hydrate layer (Hensen, 2004). Trickling is the normal mode by which most continental margin methane is released. Because it furnishes methane to the sediment close (within about 5 cm, or 2 inches) to the seafloor at a relatively steady rate, it furnishes a steady diet for methanotrophs. Some of the methane which trickles out, perhaps due to frigid seafloor currents, may re-form as hydrate at or near the sediment-water interface. There it may accumulate as larger chunks, possibly up to the size of a small house. But as methane hydrate is lighter than water, there is a limit to how much will accumulate before it tears free and floats to the ocean surface. As it floats upward, of course, it will effervesce, and will continue to do so on the ocean surface until it has completely dissociated. This rafting process is what provided the Ocean Selector with its complement of methane hydrate. Rafting, however, is not a significant mode of methane release. Because the free gas below the methane hydrate is at critical pressure (Hornbach, 2004), changes in the pressure of the overlying seawater, due to changes in sea level, may cause it to force open faults in the sediment. Similarly, the warming of the free methane will increase its pressure, helping pry open the seafloor faults. Because those faults often cut through the hydrate layer as well as the overlying sediments, warmer water seeping through the faults will dissociate hydrate and facilitate the escape of free methane below. This venting of free methane via faults would continue as long as the pressure of the free methane and fluids can hold those faults open. Faults, it should be noted, are not just simple breaks in rock or consolidated sediments. They are frequently highly complex, branched and braided even at the smallest scales. Thus, when a submarine fault is "pried open," that will not cause a gaping crack in the seafloor. Instead, just enough space will be created to allow the escape of gas, and as those who have ever had a gas leak know, that can be tiny indeed. (Leaky roofs or ceilings also illustrate the point, but with a liquid rather than a gas.) With increased pressure, the cracks that comprise the fault widen; with decreased pressure, they narrow and may close completely. Thus, depending on the pressure of the free methane and fluid, more or less of it will be released by this venting process. Presumably this happens intermittently even in today's oceans; warming will increase, and eventually substantially increase, its occurrence. Venting is a release mode which allows the release of free methane from below the hydrate and dissociated methane from the hydrate itself. It produces pock marks and mud mounds on the seafloor surface. Venting may also be responsible for the formation of mud volcanoes, though substantial quantities of dissociated hydrate methane may be required as well. It is distinguishable from trickling by being more episodic, as the pressure of free gas forces open faults in the sediment. Trickling is a slower, more normal mode of release. Methane hydrates are quite buoyant, and are even, as mentioned previously, more buoyant than water. But methane hydrates usually remain stuck in the mud in which they formed. Nonetheless, their buoyancy, coupled with the buoyancy of the free methane below them can allow them to push upwards and distort the overlying strata. Thus one seafloor structure commonly found in association with methane hydrates is the dome. Some dome-like structures are the surface manifestations of subsurface features called diapirs: large, narrow, roughly cone-shaped columns/pillars that have intruded from below into overlying sediments. Diapirs form when more buoyant sediments lie beneath consolidated, but less deformable sediments or sedimentary rocks. Diapirs are often composed of salt because salt is buoyant and very easily deformed, especially because it easily absorbs and frequently contains large quantities of water. But diapirs of methane hydrate, and even of shale, a sedimentary rock, are also common. On occasion, the pressure of the buoyant methane hydrate and free methane gas can break through the domal structure to erupt as a mud volcano. Produced by the dissociation of large quantities of methane hydrate, mud volcanoes form structures that resemble typical volcanic cones. But unlike ordinary volcanoes, they erupt no hot magma or ash. (There are indeed ordinary volcanoes on the ocean floor, both at the oceanic ridges where new crust is formed, and in places where what are known as "hot spots" are present. Some of these ordinary volcanoes are active; many more are extinct.) Instead, mud volcanoes are the result of water and gas forcing its way through overlying mud. They form when sediments containing large amounts of fluid are compressed and the fluid squeezed out and upwards through faults and cracks in overlying sediments. The pressure of the fluid, which is primarily water, and the highly buoyant methane fractures and shatters more hardened, consolidated mud, carrying irregular and angular chunks (mud breccia) upwards, and leaving them imbedded in the softer muds above, or spewed out on the nearby ocean floor. Mud volcanoes, when active, can emit clouds of water, silt, and gas, primarily methane from hydrate. That the source of the water in this fluid is hydrate is indicated by its freshness, in contrast to the salinity of the surrounding seawater. The expelled fluid does mix with the seawater, however, often producing detectable plumes of water of low salinity and high methane content in the seawater above. Using geological dating techniques, scientists can determine that the mud breccia chunks found on the seafloor are from older, and formerly deeper, sediments than those in which they are found, confirming that they were erupted from these undersea mud volcanoes. The mud chunks smell of the familiar gas hydrogen sulfide (which provides the odor of rotten eggs), because methane itself is odorless. Mud volcanoes, like other volcanoes, are typically circular when viewed from above, average about a kilometer (0.6 mile) in diameter, and rise about 100 meters (over 300 feet) above the seafloor. In the Anaximander mud volcano field in the eastern Mediterranean, the largest volcano is about 2.5 kilometers (1.5 miles) in diameter, and stands about 360 meters (more than 1000 feet) above the seafloor. Its mud flows cover an area about 50 square kilometers (about 20 square miles). The smallest of the mud volcanoes in this field are only about 700 meters (3000 feet) across, and 60 meters (200 feet) high (Woodside, 1998). Worldwide, there are an estimated 1800 mud volcanoes. In the Arctic, similar conical, volcano-shaped structures are found in permafrost, both on land and underwater on the continental margin. They are commonly 30-50 m high, and as large as 400 m across. Called pingos (or alternatively, boolgoonyakhs! ), they also vent methane-containing fluids, presumably from melted hydrate. The eruption of dissociated methane hydrate from sediment can leave clear evidence of that release. Seismic images of mud volcanoes reveal that -- unlike ordinary volcanoes -- strata dip downwards toward the interior of the volcano, toward the passages where the fluids escaped. This pattern can be explained by the collapse of overlying strata once hydrate fluids have been vented, and/or by the weight of some of the erupted sediments settling back down on the volcano (Woodside, 1998). Mud volcanism, or simply the venting of large quantities of methane hydrate, may explain the presence of crater-shaped structures on the continental slope off Cape Hatteras, North Carolina. What were thought to be "cracks" in the slope have turned out to be giant, elongated craters, two by five kilometers (1.2 by 3 miles) across (Driscoll, 2000). Mud volcanism is presumably an occasional phenomenon. Once a mud volcano has erupted and thereby released its underlying store of methane, further major eruptions are probably unlikely. Just as ripple marks are carved in sand by the action of waves (both on- and off-shore), so also are sediment waves sometimes carved in undersea sediments. Sediment waves are caused by the undersea currents which can move vast quantities of sediment into ridges and troughs. At Blake Ridge off the Florida/Carolina coast, the ridges are straight to curved, even crescent-shaped, and may be as much as 10 kilometers (6 miles) long. These ridges, which can be as much as 150 meters (yards) in height above their neighboring troughs, are one to three kilometers (about 0.6 to 2 miles) apart (Holbrook, 2002). Methane apparently was rapidly, gradually, or episodically released from hydrate as the sediment was eroded and redeposited. The amount of methane released by these sediment waves (which have little or no hydrate left) can be estimated by comparison with nearby areas which have not been similarly disturbed. The amount turns out to have been considerable: some 600 million tons, equivalent to about 12% of the atmosphere's present content. At Blake Ridge, however, this quantity may have been released over as much as two and a half million years (Holbrook, 2002), making this release mode non-catastrophic. It seems unlikely that sediment wave release could produce, or even significantly contribute to, the major negative carbon isotope excursions seen in the geological record. Moreover, although the direction and strength of underwater currents could change dramatically with changes in sea level or ocean temperature, thereby altering sediment wave erosional and depositional patterns, neither temperature nor sea level change directly affects these patterns. Other release modes are therefore more likely to be responsible for major releases of methane. Whereas venting primarily involves the free methane below the hydrate, massive dissociation involves the hydrate itself. The term "dissociation" refers to the breakup of the clathrate structure of the hydrate, those icy lattices that contain the methane. Once these lattices dissolve, the methane is released. Small amounts of methane are always being released through dissociation; massive dissociation refers to significant breakup of the clathrates, and a major release of methane. This can occur only by the warming of the sediments, or by their depressurization caused by a fall in sea level. On wide and flat continental margins, where there is no gradient which would allow for slumping, massive dissociation is likely the only important mechanism for large-scale methane release. Because the dissociation is the consequence of pressure or temperature changes, this process is protracted compared with other modes of methane release, though it can occur rapidly as measured in geologic time. This rapid release is presumably greater than the methanotrophs can accommodate, and methane is released into the water column and then the atmosphere. Slumps (submarine landslides) take place on continental slopes. There the seafloor gradient is sufficient to allow for such submarine landslides, under the appropriate conditions. Methane hydrate can cause or contribute to the instability of continental margins and the likelihood of submarine landslides in several ways. First, because the methane hydrate stability zone overlays a zone of free gas marked by the BSR, the BSR becomes a potentially unstable boundary layer where slippage can occur. Second, this boundary layer can be made even more unstable by the increase of gas pressure produced as the amount of free methane accumulates below. This results in the BSR becoming "overpressured." Finally, hydrate dissociation within the continental slope can weaken the sediment pile, and the additional water and gas within the sediment provides a low friction layer on which the overlying sediments can slide. In addition, some deeply buried seafloor sediments contain silty sands which can trap astonishingly large quantities of water, reducing these strata to little more than slurries. These waterlogged sediments are the consequence of high rates of sedimentation, and are therefore most likely to be found in seafloor areas that were near continental ice sheets during a previous last ice age. With their great weight, continental ice sheets scrape all soil and sand from the areas they move across, and grind the rock below to powder (called "rock flour"). Thus, they can transport immense quantities of sand, rock, and rock flour directly to the ocean, and, upon melting, leave behind on the land immense quantities of this debris to be later carried to the ocean by the action of rivers. Ongoing sedimentation can bury the waterlogged sediments, and result in highly unstable seafloor conditions extending to depths of hundreds of meters (yards; Dugan and Flemings, 2000). Slumping itself may be triggered by an earthquake, an increase of sediment weight, or the gradual or sudden dissociation of hydrate in the sediments. The association between hydrate dissociation and slumping, in fact, was one of the first dangers of seafloor hydrates to be recognized, now almost thirty years ago (McIver, 1977). Not surprisingly, slumping is the most abrupt and potentially catastrophic of the various modes of methane release. Certain of the release modes of continental margin methane are more or less continuous, and seem to represent the usual way that methane is released from margin sediment. These modes are trickling and rafting, though rafting is a very minor release mode and only attracts attention because of its startling unfamiliarity. Sediment waves presumably develop regularly in various parts of the world ocean seafloor over long periods of time, and their methane likely is also released gradually. Venting occurs episodically, as free methane pressure builds in sediment and then forces its way out through faults or such other fluid release structures as pockmarks. Mud volcanism is an occasional, local phenomenon that periodically injects small quantities of methane into the ocean and atmosphere. The remaining two modes allow for catastrophic release. Rapidly warmed or depressurized, great quantities of methane may be released from hydrate and below in geologically short periods of time: a few centuries at most. And slumping -- also attributable to warming or depressurization -- can release huge amounts of methane almost instantaneously. Moreover, the quantity of methane that can be released in a single event is vastly greater than can be consumed by methanotrophs. Massive landslides are among the most rapid and destructive geological processes on the planet. But since submarine landslides are not visible to the unaided eye -- and in the murky depths of the ocean can only be seen and photographed in tiny areas which provide no clue as to their real extent -- a comparison with a highly visible terrestrial landslide may be useful. In southern California is the Blackhawk slide, found on a northern slope of the San Bernardino Mountains. These mountains, north of the Los Angeles Basin, are part of the Transverse Ranges and are some of the fastest rising mountains in the world. 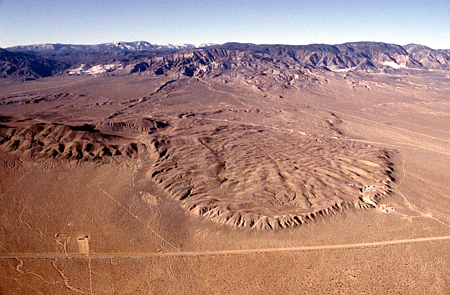 The Blackhawk slide originated on Blackhawk Mountain, and flowed down Blackhawk Canyon, then emptied on to the nearby Mojave Desert floor. The slide occurred about 17,000 years ago, but according to the generally accepted scenario for its formation, it entirely took place in about 80 seconds, a geological eyeblink. The velocity of the slide is estimated to have at times exceeded 400 kilometers (250 miles) per hour, with the moving rock sometimes riding on a highly compressed cushion of air and at others being fully airborne, more than a hundred meters (yards) above the ground. The slide left a huge apron of debris 8 kilometers (5 miles) long, 3.2 kilometers (2 miles) wide, and from 10 to 30 meters (yards) deep (Norris and Webb, 1990). The Blackhawk Slide, Mojave Desert, southern California. Yet the Blackhawk slide (which did not involve the release of methane), despite its awesome appearance, involved only 1/1000th as much material as a methane release related slide in the eastern Mediterranean! Called "The Great Slide," it is found in the same area as the Anaximander mud volcano field, a region of abundant seafloor methane release structures. The Great Slide covers from 1200 to 2200 square kilometers (460 to 845 square miles) and involved at least 550 cubic kilometers (135 cubic kilometers) of sediment (Woodside, 1998). That's enough to bury Manhattan Island 10 kilometers (6 miles) deep in mud. Nor is the Anaximander area slide unusual. Huge submarine landslides are common to the oceans of the world, though fortunately they do not occur frequently. Depressurization is the likely cause of the Storegga ("Great-edge") Slide off the coast of Norway. Actually, the Storegga Slide is comprised of three separate slides, one probably about 50,000 to 30,000 years old, the others dating to about 8000 to 6000 years ago. The cause of the first slide is unknown, but the cause of the other two likely was related to the conclusion of the most recent ice age, about 12,000 to 10,000 ago (Bugge, 1988). The ice age put a huge weight of ice on much of the continents of Europe and North America. These great continental ice sheets were one and a half to three kilometers (one to two miles) thick. Their colossal weight pressed down on and warped the crust of the earth in the areas covered by the ice. At the end of the ice age, the crust gradually returned to its former position. That process is still going on in various parts of the world, including Puget Sound area of Washington State. This process is called glacial rebound. Glacial rebound occurs because the area formerly under the great weight of ice is returning to isostatic equilibrium. Isostatic equilibrium is a big phrase for something which is very familiar. Consider the rubber ducky floating in the bathtub. The duck is in isostatic equilibrium with the water. But push that duck under water: it pushes against your hand, wanting to float free. The duck is no longer in isostatic equilibrium with the water. It takes the continuous application of the force of your hand to keep it under the surface. When you release the duck, it pops up into the air above the water surface, then splashes back down, as it returns to isostatic equilibrium. The crust of the earth is also generally in isostatic equilibrium with the mantle rock lower down. That may seem surprising, because we don't usually think of the ground we walk on as floating. For unlike the water in the tub, the earth seems solid. And, generally speaking, it is. But while the crust doesn't exactly float, it does have a bit of give. So when a great weight is put on the crust, it sags, ever so slightly if the weight is small, but more if the weight is considerable. Dams, for example, hold back a great deal of water, and the weight of that water can actually cause the underlying crust to buckle. The amount of buckling is small, but it can cause minor -- or quite major -- consequences. Minor effects include tiny, virtually undetectable earthquakes. Larger earthquakes are also possible, however, depending on the nature of the crust upon which the dam and its reservoir sit. In India, such an earthquake was the probable trigger for the 1993 Killari earthquake, centered near a dam on the Lower Tirna River, which leveled 52 villages and killed almost 10,000 people in an area which had previously had been considered a seismically stable part of the subcontinent. In the case of the Storegga slides, the weight upon the crust was ice. Earthquakes, perhaps only small ones, presumably accompanied both the pressing down of the crust as the great European ice sheet accumulated, and when the pressure was released during deglaciation, The ice sheet covered not only that land currently above sea level, but also, because the ice accumulation had significantly lowered sea level, areas of the continental margins now well under water. At the end of the ice age, between 12,000 and 10,000 years ago, the great continental ice sheets melted. Then, probably accompanied by periodic earthquakes, the continental crust began to rebound. At least twice, perhaps triggered by such a quake, a huge portion of the methane hydrate-laden Storegga area sediment off the Norwegian coast gave way. The total amount (in all three Storegga slides) of sediment that slid is estimated at about 5500 cubic kilometers (1340 cubic miles), enough to bury Manhattan Island to a depth of almost 95 kilometers (almost 60 miles!) or San Francisco or Boston to a depth of 45 kilometers (26 1/2 miles) deep. Some of this sediment slid as far as 800 kilometers (500 miles) down and across the adjacent ocean floor, presumably by hydroplaning on an incompressible slick of water (Elverkøi, 2004). The slides produced tsunamis whose debris is now found in coastal Norwegian lakes 18 meters (yards) above sea level. At the Shetland Islands, just over 100 kilometers (60 miles) from the northeast tip of Scotland ­ and about 300 km (180 miles) from the closest part of the Storegga slide ­ tsunami run-up height reached 20 to 25 meters (yards). The tsunami evidence is seen in lake deposits and peat outcrops, where a sand layer, ripped-up chunks of ancient peat, pieces of branches and tree trunks, and bowling ball sized rocks. Carbon dating of peat debris and sticks in and above the tsunami deposit has confirmed that the second Storegga slide took place about 7300 years before the present (Bondevik, 2003). Tsunamis are not extinction mechanisms, though occasionally they may wipe out a species of coastal organisms that has a quite limited range. Coastal inhabitants in the affected areas, however, may suffer greatly. Supportive evidence for the rapid methane release scenario comes from independent estimates of the length of the extinction event itself. Using the various cycles of the obliquity (ovalness) of the Earth's orbit and the direction and tilt of its axis (cycles referred to as the Milankovitch cycles), the main Permian-Triassic faunal changes seem to have occurred within a period of less than 60,000 years, and perhaps as few as 8000 (Rampino, 2000). This estimate compares favorably with the estimate for the length of the negative carbon isotope excursion of less than 30,000 years (Rampino, 2000). The fungal spike at the end-Permian/Early Triassic, in the Israeli rocks, is estimated to have lasted only as long as 54,000 years and perhaps less, based on the estimated rate of sedimentation for such shallow-marine sedimentary rocks (Eshet, 1995). A calculation of the length of the fungal spike in the southern Alps yields 25,000 years or less (Eshet, 1995, using the data from Sweet, 1992). In China, the Meishan section yields an estimated duration of about 200,000 years for the fungal abundance (Ouyang and Utting, 1990, cited in Eshet, 1995). The "acritarch explosion," appears to have occurred in a period of about 200,000 years, though they were declining in numbers after 100,000 years (Eshet, 1995, Figure 2). Finally, as determined by carbon isotopes in kerogen (fossilized organic matter), the negative isotopic excursion (here measured at about ­ 3.6 ± 1) lasted from 50,000 to 100,000 years before primary productivity was restored (Wang, 1994). All of these estimates match up well with the roughly 10,000 to 20,000 years for a carbon isotope excursion produced by the dissociation of hydrate methane as seen for the Late Paleocene Thermal Maximum, and for the roughly 100,000 to 200,000 years for recovery to normal values. It is important to emphasize that these time estimates derive from quite unrelated lines of evidence: the cycles of Earth's orbit and tilt, carbon isotopes from kerogen, how long fungi spiked and waned, how long unusual numbers of acritarchs were around. Though other suggested scenarios for the cause of the end-Permian extinction may be found to be compatible with these time estimates, it is only the margin methane proposal which independently generated such timelines (based on the LPTM and computer modeling), and enjoys several independent lines of support by way of confirmation. (i) "the widespread evidence of anoxia in latest Permian-earliest Triassic deep-ocean sediments, including accumulation of massive amounts of organic carbon." ···The massive release of seafloor methane does cause anoxia in the water column, and the accumulation of large amounts of carbon in the sediments would be an immediate effect of the extinction. The extended anoxia and black shale accumulation noted by Isozaki (1994; 1997) was probably due to stagnant ocean conditions fostering an anaerobic deep marine biota. Anaerobic decomposition takes place much more slowly, and less efficiently, than decomposition by aerobes. More organic debris from surface waters would therefore have reached the seafloor. (ii) "the ^13C isotopic excursion at or near the Permian-Triassic boundary in both marine and terrestrial ecosystems, although the precise relation between peak extinction and the isotopic shift remains unclear." ···Biogenic seafloor methane explains the carbon isotope excursion because it is so depleted in ^13C. (iii) "evidence for anoxia in nearshore settings at or close to the Permian-Triassic boundary, coincident with a major earliest Triassic transgression." ···Nearshore anoxia can be explained by the same methane release mechanisms as previously described. In addition, the activity of anaerobic methanotrophs in the top few centimeters (two inches) of sediment produces hydrogen sulfide, which itself is toxic and draws down dissolved marine oxygen. The Early Triassic transgression mentioned by the authors may reflect the sinking of northern Laurasia after the eruption of Siberian Traps magma, perhaps with a small contribution from the melting of mountain glaciers. However, as noted previously, transgression-regression data may not be reliable, and in this case the data is from twenty years ago (Bowring, 1998, relies on Holser and Magaritz, 1987, whose data comes from earlier sources). (iv) "patterns of extinction consistent with hypocapnia or CO¸2 poisoning." ···Presumably the authors refer to hypercapnia, carbon dioxide excess, rather than hypocapnia, having too little carbon dioxide. Methane, as noted numerous times, is quickly oxidized to carbon dioxide. (v) "the age of the Siberian Traps and extinction being the same within error." ···With the Traps as trigger, permafrost and Arctic continental margin methane would have started being released immediately. (vi) "a lack of evidence for a latest Permian glaciation." ···The methane release proposal posits a possible short-term cooling, not from the methane itself, but from the Siberian Traps volcanism. This cooling episode would have been over within a matter of years (not sufficient for glaciation), and the long-term warming would have quickly become dominant. Further pulses of Traps volcanism could have caused additional short-term cooling, but these would have been minor blips in the overall warming pattern. The methane release theory does not postulate any glaciation for the Late Permian or Early Triassic. (vii) "and sudden climate warming at and after the boundary." ···This warming would have been caused by the greenhouse gas methane, its successor gas carbon dioxide, and the increased presence in the atmosphere of water vapor, the result of the warming. 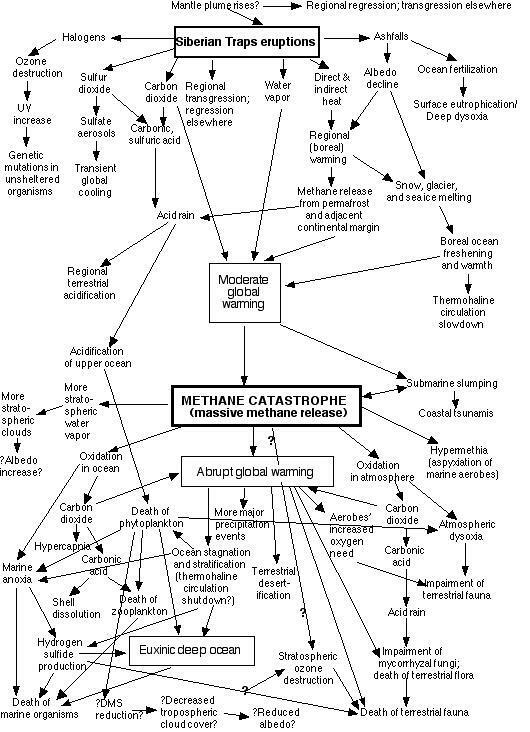 Thus the continental margin methane release proposal meets all of the criteria suggested by Bowring and his co-workers (1998). The continental margin methane release theory relies on Siberian Traps volcanism as the trigger for methane release. But if both Siberian Traps volcanism and margin methane release were involved in the end-Permian extinction, why should the Siberian Traps be considered as having the subsidiary rather than the major role in the extinction? What if the methane release was basically just another minor consequence of the Traps volcanism, and Traps volcanism was in fact mainly responsible for the end-Permian extinction? 1. As far as we know, volcanism is limited in its effects. Other substantial eruptions have -- at most -- only produced limited local or regional effects. Subaerial eruptions (surface eruptions, that is, those which occur "under the air" rather than underwater) can produce cooling on a regional and perhaps hemispheric scale, but that cooling is short-term: a year or so. Submarine eruptions may have the power to warm nearby waters, but the effectiveness of that heating would be limited if the eruption occurred in the midst of large ocean. In smaller oceans which are partly closed off from circulation with larger oceans, the effect of submarine eruptions appears to be magnified, as with the North Atlantic Igneous Province and/or Caribbean eruptions which occurred at the Latest Paleocene Thermal Maximum, and may have triggered the hydrate methane release of that time. On the other hand, the far greater submarine eruptions that created the underwater Ontong-Java Plateau in the southwestern Pacific around 100 million years ago apparently had no such effect. Occurring in a much larger and more open body of water, there was no catastrophic release of methane, and no effect on living things was noted in the fossil record. 2. Even the Deccan Traps eruptions of 66 million years ago seem to have had little effect on the biota of the time. This eruptive sequence may be the one most comparable in size and location (near the continental margin) to the Siberian Traps eruptions, but its biological consequences, if any, were minimal. It came too early for the end-Cretaceous extinctions, for which the Alvarez impact scenario seems quite an adequate explanation. The Deccan Traps eruptions, in addition, do not seem to have triggered any release of continental margin methane. This may be due to their location at the time of their eruption. India was at the time an island continent, moving across the Indian Ocean after having broken away from Gondwana. It was approaching the Asian continent, with which it would collide in about another fifteen million years. It was in the open ocean, at about equatorial latitude. This location would not have caused any serious disruption of global thermohaline circulation. The Siberian Traps, by contrast, erupted in a much more oceanographically and climatologically vulnerable part of the world, where they increased solar heat absorption by reducing reflectivity (albedo), melted sea ice, warmed seawater, and disrupted global thermohaline circulation. Further, the Deccan Traps erupted at the end of a period of protracted global warmth. The quantity of seafloor methane hydrate would have been much less than that at the end of the Permian, which followed the longest ice age of the Phanerozoic. Thus even as a trigger for another, greater environmental disaster -- the release of hydrate methane -- the Deccan Traps had poor timing and bad "location, location, location." 3. By contrast, large-scale methane release can indeed produce serious global consequences. It has great potential as a greenhouse gas for warming the planet, and, of course, it is quickly oxidized to carbon dioxide. Thus, for warming the planet, large quantities of methane are an excellent, readily-available resource. In addition, that methane has the ability to directly cause oceanic anoxia, and to reduce the level of atmospheric oxygen by interfering with the activity of marine and terrestrial photosynthesizers. Therefore, methane has the potential to produce more significant, global, and protracted consequences for Earth's organisms than did Siberian Traps volcanism alone. Nonetheless, the direct ocean warming effects of Siberian Traps volcanism, together with the indirect warming from the release of carbon dioxide and decreased albedo, account for some of the characteristics that make the end-Permian methane release different. Massive release of hydrate methane seems only to have occurred at rare intervals during the past hundreds of millions of years. The period of the Late Paleocene Thermal Maximum, and the oceanic anoxic events early in the Mesozoic, as well as possible releases prior to the final episode at the end of the Permian, may represent the few occasions when such massive releases took place. But it is the location and volume of Siberian Traps volcanism which makes the end-Permian release unique, and likely the greatest methane catastrophe of the Phanerozoic. In the case of the various theories about the end-Permian extinction, what shall we find sufficient? Recently there have been a number of new and revived proposals regarding the cause(s) of the end-Permian extinction. These include methane explosions resulting from the expulsion of dissolved methane from ocean waters (Ryskin, 2003), a "champagne cork-popping" of the planet that produces continental flood basalt events (Morgan, 2004), and another resuscitation of the discredited impact scenario (Basu, 2003). The first of these theories starts with an allegedly anoxic ocean. The anoxia allows methane to reach, or almost reach, saturation levels (where the seawater has as much dissolved methane as it can hold) in the ocean. Then, perhaps triggered by an earthquake, volcano, warm current, or other disturbance -- or without any external cause at all -- this gas suddenly erupts from the ocean, much like soda from a shaken pop bottle. Ignited by lightning, the methane devastates life on land, and the Earth is plunged either into a period of cooling (caused by sun-obscuring firestorms) or warming (caused by the increased carbon dioxide in the atmosphere)(Ryskin, 2003). Despite meticulous attention to the quantitative and physical aspects of such an eruption, the proposal neglects an essential biological dimension. An anoxic ocean is not necessarily a biologically empty ocean. In fact, it seems highly unlikely that, as methane quantities increased in the ocean, they would not be consumed by bacterial and archaeal methanotrophs. Even if such organisms were rare or absent prior to the development of anoxia, they would quickly expand into such an environment as dysoxia increased. Since the production of methane in the seafloor is relatively slow, the expansion of methanotrophy would be able to keep pace. The concentrations of methane postulated by the theory would never develop, and therefore the methane explosions it proposes could not occur. The Lake Nyos analogy is inappropriate because the gas in that volcanic lake is primarily carbon dioxide. While carbon dioxide may be consumed by photosynthetic organisms, these organisms only exist near the water surface where they can obtain light, and could not have lessened the amount of carbon dioxide that had seeped into the deep waters of the lake from the magma source below. Thus critical quantities of carbon dioxide can accumulate in volcanic lakes, but critical quantities of methane are unlikely to accumulate in the ocean. There's an additional problem with this end-Permian worldwide conflagration proposal: where's the soot? At the end of the Cretaceous, there indeed was a worldwide conflagration, ignited by the extreme heat from the impact. Though the fires may have spared some areas (Belcher, 2003), it does seem that they were global in reach, and they did leave evidence of their destruction: soot found in numerous localities around the planet, exactly at the K-T boundary (Paine, 1999; Kring and Durda, 2003). Methane, of course, is always advertized as a "clean-burning" fuel and so would not have left its own traces, but forested areas along coasts could not have been immune from firestorms in nearby oceans -- firestorms which, according to the theory's proponent, may have occurred repeatedly. But there's no soot in the Permian-Triassic boundary sections. And no soot, no worldwide conflagration(s). The second theory proposes that the accumulation of gas associated with magma rising through Earth's mantle blasted out a chunk of the planet's crust at the start of a continental flood basalt (large igneous province) eruption. As with the oceanic methane explosion theory, this theory relies on gas coming out of solution. In this case, the gas is carbon dioxide, coming out of melted rock (magma) as it approached to within about 80 kilometers (50 miles) of the surface. The theory proposes that this gas would blast a large column of overlying rock into the atmosphere, spewing gas and rock fragments over the planet's surface, laying waste to some terrestrial organisms even before the inevitable greenhouse conditions set in. The pressure of the rock around the blast hole would quickly slam it shut (Morgan, 2004). The authors of this proposal label this mode of eruption a "Verneshot" after the method of escape from the interior of the planet by the adventurers in Jules Verne's "A Journey to the Center of the Earth." In this famous late nineteenth French science fiction novel, the adventurers are rafted upwards on the magma of an erupting volcano. Unfortunately, the Verneshot theorists attribute the end-Cretaceous extinction of the dinosaurs to a Verneshot associated with the Deccan Traps eruption (Morgan, 2004). But as the Cretaceous-Tertiary extinction came after that eruption, and the attribution of the extinction to an extraterrestrial impact (the Alvarez scenario) has been generally accepted, this claim undercuts the credibility of the theory. In addition, the theory fails to provide any evidence of either the former holes from which the purported rock columns were ejected or the impact sites where the rock column projectiles landed. The third proposal attempts to breathe life into the end-Permian impact scenario. New evidence, in the form of meteorite fragments from Antarctica, forms the basis for the reassertion of an end-Permian impactor. While the meteorite from which the fragments derive is a standard variety (a chondrite, the same as for the end-Cretaceous impact), the fragments contain unusual metal grains. Some of these tiny grains are composed of iron, nickel and silicon (Fe-Ni-Si), others are almost pure iron (Basu, 2003). The proposal again invokes the purported discovery of Permian-Triassic boundary fullerenes (Becker and Poreda are co-authors of this paper as well as that of Becker, 2001; see above, Impact Theory) for support, though as pointed out in a accompanying commentary (Kerr, 2003), none but Becker has been able to find such fullerenes. The discovery of alleged (and much disputed) shocked quartz grains is also employed as confirmatory evidence. The use of such disputed evidence apparently has failed to convince most scientists who were asked their opinions, and the ability of almost pure grains of iron to survive for a quarter of a billion years without weathering has provoked the response, "'It's astonishing, it's incredible, it's unbelievable'" (Kerr, 2003; the quotation is from meteor specialist Jeffrey Grossman of the United States Geological Survey). (Becker and Poreda have continued to provide evidence for an end-Permian impact, and that evidence continues to be questioned. In 2004, Becker and Poreda and colleagues asserted that seismic imaging and gravity measurements from the northwestern continental margin of Australia displayed evidence of a buried end-Permian impact crater. Drill cores from the alleged impact structure, labeled the Bedout ("bedoo," as in whoop-bedoo!) Crater, have purportedly revealed nearly pure silica, fractured and shocked feldspar, and glass spherules in broken, angular rocks called breccias. The scientists indicate that these features imply the presence of a large melted area (a melt sheet) produced by the alleged impact. In addition, the seismic and gravity data, they suggest, also reveal the presence of a common impact crater attribute, a central uplift or peak [Becker, 2004]. Central peaks are frequently found in impact craters; even the modest magnification provided by binoculars or small telescopes reveals many central peaks in lunar craters. Becker and Poreda and colleagues argue that this alleged central uplift helps define a crater "similar in size to Chicxulub," the crater that marks the end-Cretaceous impact. They further assert that although the purported impact crater is not antipodal -- directly opposite -- to the site of Siberian Traps volcanism, the impact may have triggered that event. All told, "The location, size, and age of the Bedout crater can account for reported occurrences of impact debris in Permian-Triassic boundary sediments worldwide." The only direct evidence offered for the age of the Bedout structure, however, is a single feldspar grain, though its age is similar to that from another grain extracted years earlier. The age dating for both grains has a high degree of uncertainty: some four and a half million years plus or minus for the new grain, some five million for the older grain. Moreover, the ages of the two grains differ by almost three million years [Becker, 2004]. In other words, even assuming that the age-dating is accurate, the uncertainty in the timing of the purported impact is about 12.5 million years. Geologists who study impacts are unconvinced by the evidence presented. Both Bevan French and Christian Koeberl, both impact petrologists (those who study impact rocks), doubt the adequacy of the offered proof. According to French, "'There's no convincing evidence for an impact origin,'" while Koeberl stated, "'I see nothing that would convince me there was an impact'" [Kerr, 2004]. A third impact petrologist, Richard Grieve, wondered where the indications of flow were in the allegedly once-molten impact rock, and questioned whether Becker's identification of a purported shock-produced mineral is actually maskelynite [a feldspar glass], as claimed. The assertion by Becker that the purported Bedout impact "can account for reported occurrences of impact debris in Permian-Triassic boundary sediments worldwide" raises additional questions. The "reported occurrences" have all been challenged; the "worldwide" distribution of impact evidence, therefore, is a worldwide distribution of dubious evidence. A widespread scattering of sparse, poor quality, questionable evidence hardly makes for a convincing case, however enthusiastic its proponents may be. The invocation of the end-Cretaceous impact as a possible cause of the Deccan Traps eruptions in support of a similar Bedout impact-Siberian Traps connection [Becker, 2004], while not central to the Becker argument, also raises questions about the way evidence has been pieced together. As note previously, there is no connection between the end-Cretaceous impact and the Deccan Traps: the Deccan Traps preceded the impact by 300,000 to as much as 500,000 years. In conjecturing that there may be two similar impact/massive volcanism geologic sequences, Becker succeeds only in undercutting her own case that there may have even been one, that of Bedout and the Siberian Traps. But that case seems extremely unlikely. The evidence we now have regarding end-Permian events, and their connection to the end-Permian extinction seem quite adequate to explain that extinction. Traps volcanism initiated the process, helping shut down thermohaline circulation and warming the globe, including releasing continental margin methane. The methane release completed the transition to anoxia in the deeper ocean, and contributed to dysoxic conditions in coastal areas. The increased acidity of rainfall, ocean-eutrophying volcanic ashfalls, toxic gas in the ocean, and occasional bursts of hydrogen sulfide from the shallow seafloor made additional contributions to the increasingly unpleasant and inhospitable ecological conditions. A serious depletion of atmospheric oxygen may also have made its deadly contribution. Most important, however, may have been the rise of global temperatures, initiated by carbon dioxide from Traps volcanism, and followed by the high atmospheric levels of methane and its successor greenhouse gas carbon dioxide. The new projections of the near-future impact of current global warming indicate that even the heating of the planet by a few degrees can have extremely lethal consequences (Thomas, 2004). What other killing mechanisms are necessary? None.